So many times we look ‘out there’ for fulfillment, for adventure and for meaning. The truth is, we have so many untapped opportunities, blessings to embrace, things to experience and places to explore right where we are! Why do we often value what is out of reach more than what we already embrace? Fully appreciating what we have in our midst will enrich our lives and bring us some of our greatest joy! 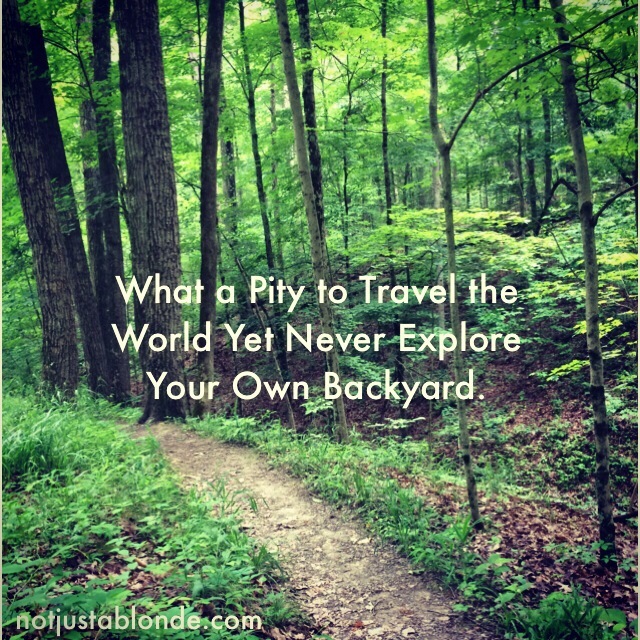 If we explore where we are we will discover the treasures in our own backyard! This title has a mass of meanings! It can mean our own home or backyard, or it can mean looking at where we are in relation to God. In my own home, God has recently been showing me how my wife’s character is of value to Him/Her, even though she does not believe and is even strongly opposed to my belief. Her strongest attribute is her ability to draw children and old people into conversation and give them pleasure in her company, and she is a very good and intuitive cook. My backyard is only about 30ft by 30ft, but there are at least five different wild flowers growing in the lawn, which is allowed to grow long so they can have a chance to flower. Yesterday the rain made a pool on the garden and several different types of bird took a bath in it and drank from it. All of these things are well worth exploring from right here. We can also explore in our minds, by thinking about our past experiences and other things that we know. This enables us to make links between things that are not obviously related and through this begin to understand more about God. ← How Often Are You in the Presence of Love?